I had wanted to do this custom for a while, but Hasbro had annouced that Able was ocming up in one of thier COmic Packs. Turns out that they meant Basso, and so I made this figure. 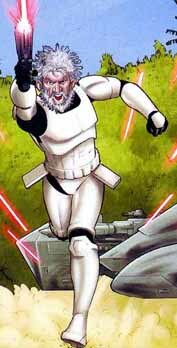 Besides, I have a feeling that if they do make this Able as a Stromtrooper, they'll do it from the next story arc, where he was clean shaved and not a crazy jungle man. I used a Comic Pack Stormie Luke and swapped the head with a Clone, and then had to repaint the figure back to white.